Am I Destined for Greatness or Barely Competent? Bestow on us the mind of Christ that we neither think more highly of ourselves than we ought to think, Nor deprecate ourselves in unbelief, calling common what you have called clean. We as Deaconesses receive a copy of the Deaconess Litany when we begin our Deaconess studies. We’re encouraged to pray it on Monday nights in our various contexts. Like many things in life I struggle to be consistent in praying this litany every Monday. But the portion quoted above is the one I know best and think about most often. 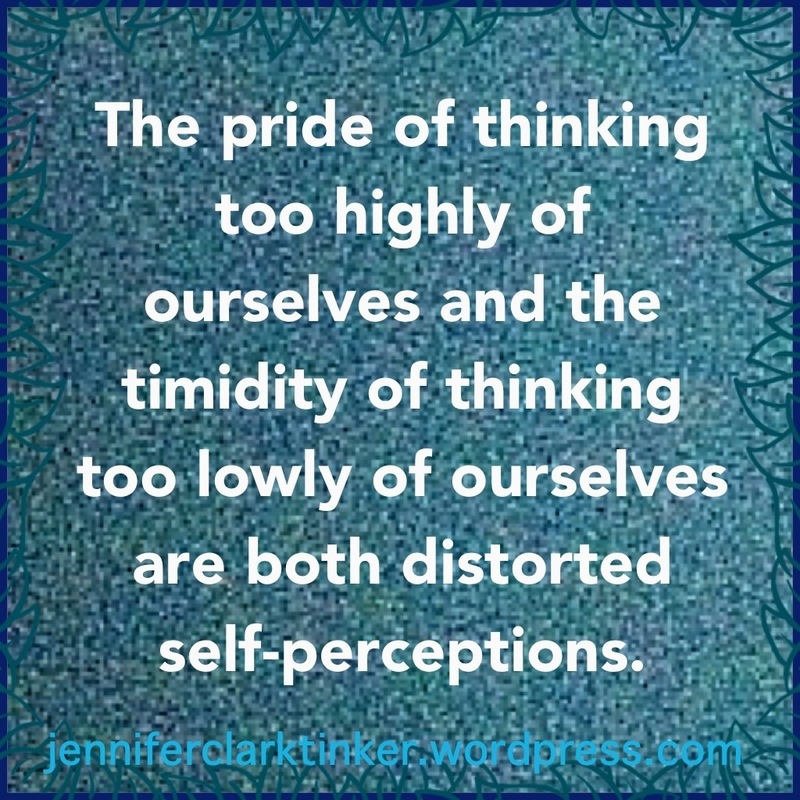 The two concerns raised–the pride of thinking too highly of ourselves and the timidity of thinking too little of ourselves are both distorted self-perceptions. They seem to be opposing views, yet I find myself falling into one then the other in short succession. When I was in high school, one summer I went to the Senior High Week at Camp Mowana, a Lutheran church camp in Ohio. One of the afternoon activities was a creative writing session. I went to it everyday because I wanted to be a writer. I loved those creative-writing sessions. I loved sitting on the veranda of the dining lodge with my feet up and my big red spiral notebook in my lap, just writing to my heart’s content. It felt so right. I already felt I wanted to be a writer and that experience at camp just reaffirmed it. By the end of that week at camp, I was so bold as to tell my fellow creative-writing campers that I was going to be “a great theological writer.” I wasn’t just hoping to be a writer, I was certain I would be “great”! I still think about writing. I still want to be a writer. And if I’m being honest, I’d still like to be great. Only now, I want to be a great writer and a great speaker. You know, I don’t ask for much. Then, of course, I feel awful for this desire to be great. I’m a Deaconess–a woman with a heart for serving others–what am I thinking with all this talk of my own greatness? So then, I try to look at my gifts objectively. And I try to think like a servant. How can I serve others with the gifts that God has given me? Are there less grand ways that I can use my gifts of writing and speaking to benefit others? Are there less public gifts of mine that I am overlooking? But all too easily an “honest” assessment of my gifts turns into discounting everything that I think about doing. Maybe I’m not achieving greatness for the simple reason that I’m not really as good at writing and speaking as I think. Maybe the struggle to find my voice on my blog is because I am not really cut out for this writing thing to begin with. Maybe I don’t get as many speaking engagements as I’d like because what I have to say just doesn’t matter to others. Maybe I should stick to my less public gifts. But then maybe I’m not that good at those either. So which is it? Am I destined for greatness or am I barely competent? The portion of the prayer I quoted is instructive on this: neither extreme is acceptable. Boasting about how great I am going to be is wrong. And disrespecting the unique gifts that I have been given is also wrong. Trying to have a healthy perspective on who I am and what I have to offer is very much a work-in-progress for me. I don’t claim to have worked this out in the least. The prayer above asks for “the mind of Christ” as a means to help us avoid the extremes of self-image. In a future post I want to explore more what that means. In the mean time, I’d love to hear from you. Do you struggle with too high or too low of a self-perception? Do you swing between the extremes? Great post, Deac! I always want to hear what you have to say. It takes a certain amount of “guts” for any of us who write to share our stuff in a public forum. We are writing about stuff that matters to us, and it opens us up for either too much criticism or too much praise. Neither is good for us. I shy away from reading too much stuff that’s “out there”. Eventually we all start sounding like one another….it makes me feel sick when I read such. And, it makes me feel even sicker when I write such. Ugh! Save us from ourselves, Lord!